The Office of Intermodal Planning and Investment is holding a public hearing tonight, July 29, from 5-7 p.m. at VDOT Headquarters, 4975 Alliance Drive, Fairfax, VA 22030. This is your opportunity to find out more about how bicycling fits into Virginia's long-range statewide multimodal transportation plan, VTrans2040. VTrans2040 is a vital project for clarifying Virginia’s transportation vision, goals, and objectives, and identifying the guiding principles and investments in infrastructure and services that will carry Virginia’s transportation system forward for the future. The Plan includes two major pieces – the VTrans2040 Vision and the VTrans2040 Multimodal Transportation Plan (VMTP). The Virginia Office of Intermodal Planning and Investment (OIPI) has been developing the VMTP, in particular the Transportation Needs Assessment. This Needs Assessment takes on added importance as a result of House Bill 2. Only projects that help address a need identified in the statewide transportation plan will be considered for funding under the statewide prioritization process. We need your input! The public meeting will include interactive discussions about the Regional Networks, Corridors of Statewide Significance (CoSS) and Urban Development Areas (UDAs). OIPI and its consultant team have already been working one-on-one with 15 regions in the Commonwealth through the MPOs in each region, and the purpose of this meeting is to bring several regions together to continue the discussions and get critical input from each region, as well as share information and updates relevant to the Transportation Needs Assessment. Fairfax County has developed draft Bicycle Parking Guidelines that we hope will be approved by the Board of Supervisors in the near future. The guidelines are desperately needed. Very few retail, commercial, or multifamily developments have bike parking. Where there is parking it is usually a type that is not recommended by the new guidelines and it it often installed or placed incorrectly. In December of last year we noticed bike parking had been installed at the new Providence Community Center. We were pleased to see 7 standard U-racks installed near the entrance to the building. So far, so good. Unfortunately they did not adhere to recommended placement guidelines; they were much too close to the edge of the concrete and one of the racks was too close to the soon-to-be-installed adjacent sidewalk handrail. We reported the problem and Supervisor Smyth asked staff to fix it. We're pleased to report that the problem has finally been fixed (and that there were bikes parked in the racks when we took the photo below yesterday evening). Additional concrete was added to the edge so that bike wheels wouldn't be extending into the grass. Unfortunately the rack that was too close to the handrail was removed and not placed elsewhere. Thank you Supervisor Smyth for your help. At FABB's request, it was Supervisor Smyth in 2007 who initiated the development of the bike parking guidelines. Providing adequate, properly placed bike parking should not be this difficult. Let's hope the Board adopts the new guidelines soon. We were recently asked to appear on Braddock District Supervisor Cook's television show, Braddock Neighborhood News. Officer Eric Ivansic of the West Springfield District bike patrol also appeared. We discussed cyclists rights, cyclist and motorist education, the Bicycle Master Plan, and other topics. We have met with Supervisor Cook in the past and his opinions about the importance of bicycling have evolved over the years. He supported the Bicycle Master Plan and agrees that we need to do more to make Fairfax a more bike-friendly place. 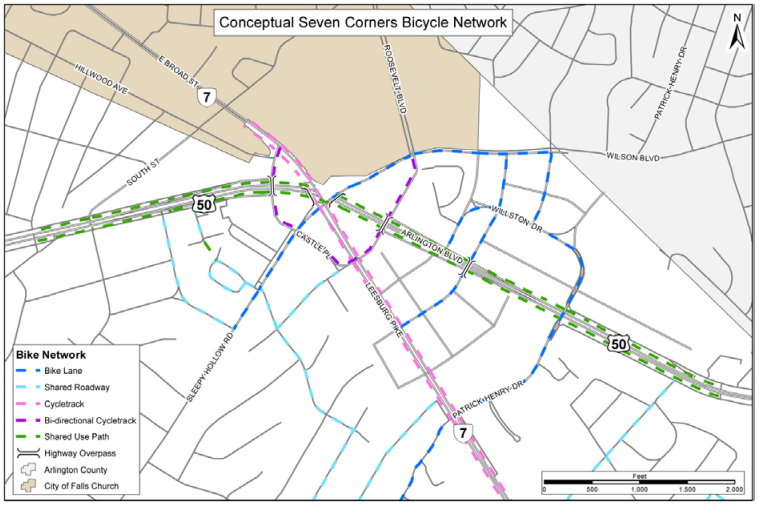 Fairfax County recently completed a redevelopment plan for the Seven Corners area, a densely populated area where several major roads converge. Navigating through the area is a challenge for cyclists and motorists. The plan includes extensive recommendations for improving bicycling in the area including bike lanes on Sleepy Hollow Rd/Wilson Blvd, cycletracks on Route 7, and parallel shared use paths on Route 50. See the Seven Corners staff report for details of the plan. The Board of Supervisors will hold a public hearing on Tuesday, July 28, 2015 at 4:30 P.M. in the Board Auditorium, 12000 Government Center Parkway, Fairfax Virginia. Cyclists are encouraged to attend the public hearing or send an email to tell the Board that you support the plan. Del. Ken Plum is a neighbor of mine and he often sees my wife Kerie and I riding past his house. We've discussed the importance of bicycling as a part of our transportation network and he is very supportive of bicycling as a mode of transportation, including agreeing to participate in the Bike/Car/Bus Challenge in 2011 when Kerie and I rode our bikes to the Reston Town Center from our neighborhood in less time than it took Del. Plum to drive there. I always pay close attention to how other countries deal with their transportation needs. Never have I seen as many bicycles as there are in Amsterdam. Multiple levels of covered parking for bicycles at the airport and train station accommodate thousands of bicycles. Most every lamp post, park bench, and railing had bicycles chained to it. Checking on my observations when I returned home I found that Amsterdam and other Dutch cities are the most bicycle-friendly in the world. There are more than 22,000 miles of bicycle lanes in the Netherlands with more than a quarter of all trips made by bicycle. That number is 38 percent in Amsterdam, a city of about a million people, and in the university city of Groningen 59 percent of all trips are by bicycle. A typical street scape in Amsterdam would include a narrow lane for automobiles, bicycle lanes in both directions, trolley rails, and a sidewalk for pedestrians. Men and women dressed for work were among those on bicycles as were many seniors. Spending a couple of days there makes it obvious why it is considered one of the best cities in the world in which to live. Shane Farthing, former WABA Executive Director, was interviewed recently by Martin Di Caro of WAMU: What's Down The Road For Biking In D.C.? A brief segment of the interview is contained on the referenced page. To hear more of the interview click on "Play" at the top of the page. See our earlier FABB post about Shane leaving WABA. Shane discusses the need to connect existing bike infrastructure to ensure that people can safely and conveniently get around by bike, the impact of Capital Bikeshare on cycling on the region, and other topics. Besides Shane leaving WABA, WABA's nemesis when it comes to the car vs. bike debate, Lon Anderson of Mid-Atlantic AAA, recently announced his retirement. Anderson talked to Dr Gridlock recently on his thoughts about transportation in the region. See some examples of Anderson's statements in the past. Everyone is invited to attend the next FABB meeting on Wednesday, July 15 starting at 7:30 p.m. at Patrick Henry Library in downtown Vienna. We'll get a report on the latest county bicycle news from acting bike coordinator Adam Lind. We'll also discuss the upcoming Clips Beer & Film Tour event in Reston on September 10 and the latest information on bicycle facilities as part of the I-66 Outside the Beltway project. On Thursday some FABB members plan to meet with Chairman Bulova and transportation staff to discuss the best alternatives for building the I-66 parallel trail. This project presents a unique opportunity to provide county residents with a major regional trail paralleling 1-66, which would be a tremendous community amenity, serving both commuting and recreational bicyclists, as well as pedestrians...The regional trail should be part of this Project fulfilling a key element of the multimodal character of the facility. The construction costs of the regional trail, including on-street sections (signage, striping, etc.) should also be included in the total Project costs. Due to the significant concerns that have been raised regarding the parallel trail, the Board requests that VDOT continue to work closely with the County to determine a reasonable alignment. 46.2-816. Following too closely. 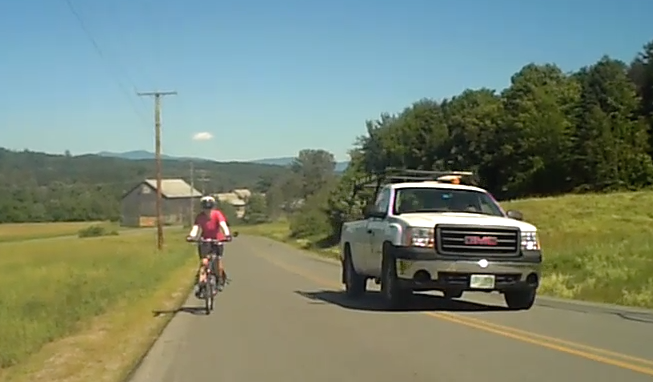 The driver of a motor vehicle shall not follow another vehicle, trailer, or semitrailer more closely than is reasonable and prudent, having due regard to the speed of both vehicles and the traffic on, and conditions of, the highway at the time. Reston Town Center is the site of the first Clips Beer & Film Tour stop in Northern Virginia. Sample some of New Belgium Brewery's more exotic beers while enjoying short films displayed on a large portable screen at the Reston Town Center Pavilion. All proceeds raised at the event go toward helping FABB make Fairfax County a better place to bike. FABB is working with New Belgium Brewery to manage this fun event. This will be a great time and we ask you to please consider helping us by volunteering. All volunteers will receive a special T-shirt (your friends will be envious! ), pizza before the event, and a special beer to celebrate afterwards. This is a great summer evening event and we need your help! Visit FABB's SignUpGenius page for info about volunteer positions and to sign up. Bike parking will be available. Everyone is encouraged to ride, walk, or take transit to the event. Everyone must have a valid government-issued ID to purchase beer tokens. Water stations will be available so bring your water bottle. See the FABB Clips Tour Page for more info. Fairfax County bicycle program staff recently presented the draft Bicycle Parking Guidelines to the Board of Supervisors. According to the slide presentation from the Board's May 19 Transportation Committee meeting, the Board will review and comment on the guidelines and then the county "will begin the public process to have elements of the guide adopted into PFM [Public Facilities Manual] as standard." 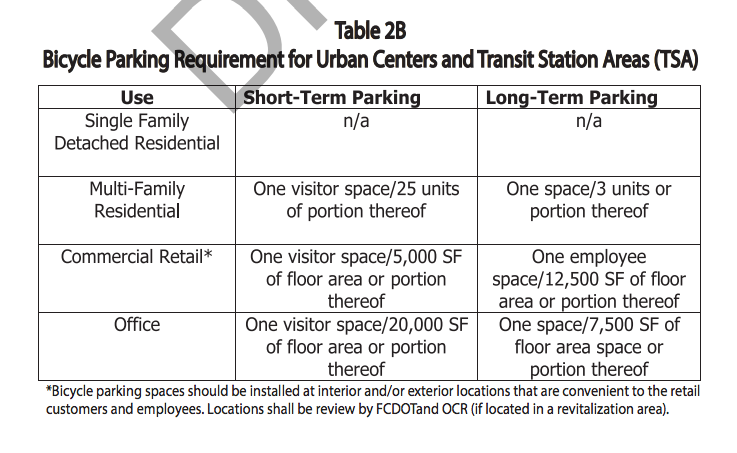 The guidelines are split into urban and non-urban. It's difficult in a large county like Fairfax to apply a single standard. 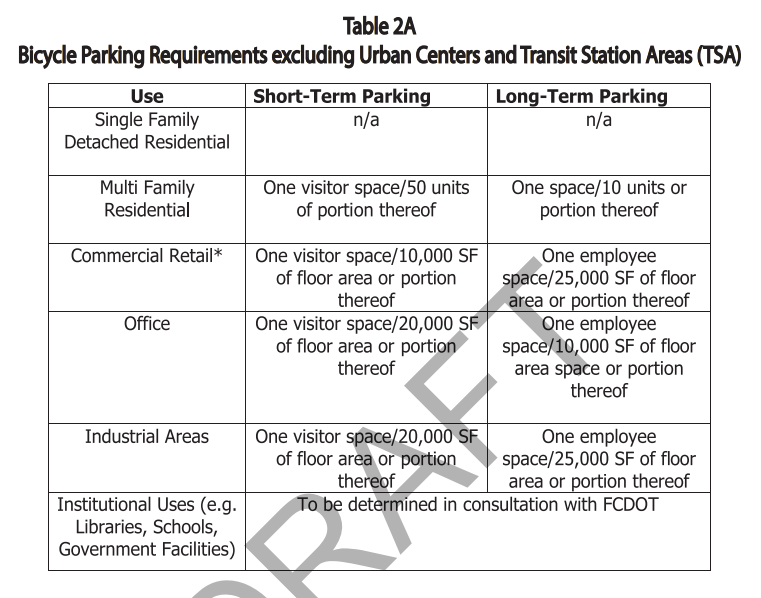 The urban guidelines are very similar to Alexandria bicycle parking standards. VDOT recently updated their Hot Line report form. It allows easier identification of a road or trail problem in an updated interface. Once a problem is reported, VDOT sends an email with a link for checking the status. We've been very satisfied with this reporting mechanism. VDOT has limited maintenance funds but they are very responsive to reports of problems. If you know of a road or trail problem such as a pothole, trail damage, or signal problem, we encourage you to use the Hot Line form. If you don't already, please Like us on Facebook and follow our Twitter feed. A discussion of the proposed I-66 trail is the subject of the Fairfax Times article by Kali Schumitz, Proposed I-66 trail sparks debate: New artery would expand opportunities for cyclists. The trail would provide a tremendous asset for Fairfax County residents and allow a significant percentage of the county population to take short trips by walking and biking. However, it would also impact several properties adjacent to I-66. Cyclists in the Interstate 66 corridor are hoping that the proposed highway widening project also will create an opportunity to add new bike facilities. However, for residents in Dunn Loring and Oakton already concerned about the highway encroaching into their yards and a community school, one proposed bike trail signifies to them another 10 feet of property that they might lose. Sen. Peterson opposes the multi-use trail, which he constantly refers to as a bike lane. In an op-ed article in the Reston Connection he said " Why do we have to accommodate ten lanes, plus a bike lane? We need to get I-66 right. Yes, the solution should be multi-modal, with buses and trains playing a major role." Without safe, convenient bicycle and pedestrian access to those buses and trains, the project will not be multi-modal. Bruce Wright, chairman of Fairfax Advocates for Better Bicycling, said his organization is working with VDOT to ensure that the project includes bike facilities that were planned for in the county’s bicycle master plan and other planning documents. For example, this includes adding bike and pedestrian facilities to bridges across I-66 that would be replaced due to the road widening. A similar effort was made when the 495 Express Lanes were being constructed. “This is a great opportunity to provide safe, convenient bike and pedestrian access,” Wright said. 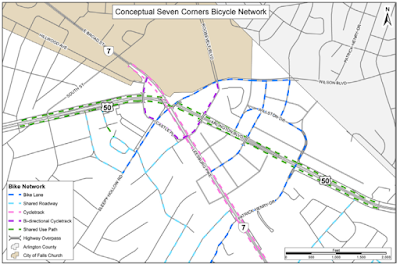 The biggest point of contention is a potential major trail that runs parallel to I-66, like the Custis Trail in Arlington County, which connects the Washington & Old Dominion Trail to the Key Bridge in Rosslyn. Wright said the high number of both commuters and recreational users of the W&OD and the Custis Trail show that there is great demand for these types of major trails. “What we really need are better first-class trails for everyone,” he said. Fairfax County bicycle program staff recently presented the draft Bicycle Parking Guidelines to the Board of Supervisors. According to the slide presentation from the Board's Transportation Committee meeting on May 19, the Board will review and comment on the guidelines and then the county "will begin the public process to have elements of the guide adopted into PFM [Public Facilities Manual] as standard." 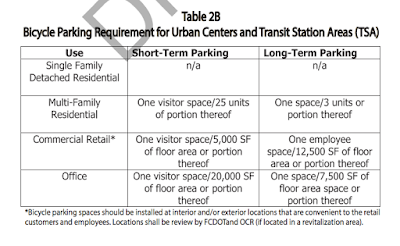 The guidelines are split into urban and non-urban. It's difficult in a large county like Fairfax to apply a single standard. 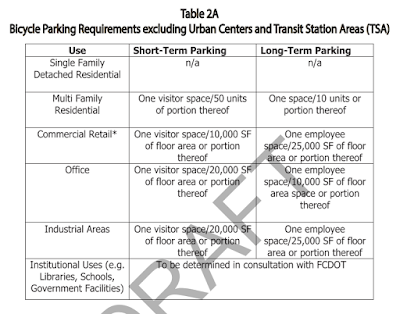 The urban guidelines are very similar to Arlington County bicycle parking standards. FABB has been advocating for these guidelines for many years. In 2007 we met with Supervisor Smyth to ask for her support for county bike parking guidelines. Later that year she asked the Board to "direct staff to investigate and report within three months how other jurisdictions are addressing these issues and develop specific standards for the County to use as part of the land development process, and to further examine how these standards could best be introduced whether through adoption of a Board Policy, an amendment to the Zoning Ordinance, or incorporation into the Public Facilities Manual." Her motion was supported unanimously. It has been a long process but we're finally getting close to having real bicycle parking standards in Fairfax.